Right about now, I should post a little bit of a disclaimer ... I'm a comic book fanboy. I've got my Green Lantern shirt (and a full set of rings), I've got my Spider-Man hat, and I've got all manner of original artwork and posters around the office. 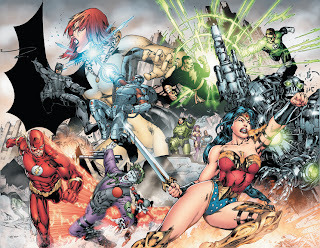 DC, Marvel, Dark Horse, IDW ... I read 'em all. Heck, every Wednesday is like Christmas all over again for me as the new books hit the stands. And long before I ever wrote my first video game review, I was working in the comic industry. I started off working in a local comic book shop, and eventually started getting more involved in the field by helping out publishers at shows, moderating forums, and even helping to connect talent I'd met with studios in need. Needless to say, my passion for comics runs deep. Of course, that can be a double edged sword as well. Sure, when a comic-related project comes out, I want it to do well, but more importantly, I want to be done right. So when I first got clued in to SOE's development of DC Universe Online a few years back, I was excited, but generally just hoping they didn't screw it all up. After all, Marvel's original MMO plans already fell apart worse than Wilson Fisk's spokesperson gig at Jenny Craig. 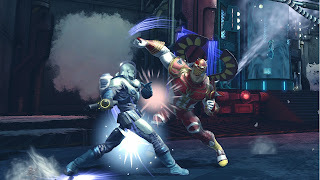 Due to a falling out between Marvel and Microsoft (who was signed to publish the game), Cryptic Studio's development on Marvel Universe Online was officially killed in Feb. 2008. A later, ten-year deal signed with Gazillion Entertainment has put Marvel back in the MMO hunt, but featuring the more casual, kid-oriented Marvel Super Hero Squad license. Gazillion still lists ongoing development of a more mainstream Marvel MMO, but hasn't exactly been forthcoming with recent updates. Meanwhile, on the other end of the spectrum, you've got those superhero MMOs that have seen the light of day, games like NCsoft's City of Heroes and Cryptic Studios' Champions Online. I've played of these and both did a pretty good job of bringing that comic book flavor to the standard MMO formula. Unfortunately, neither had the foundation of an established franchise to back them up. Sure, City of Heroes eventually had a short lived comic series from Blue King Productions, and later with Top Cow, but it never really took off. Also, Champions Online (which coincidentally was built off the backbone of the failed Marvel project) was based on an established pen-and-paper role playing system, it also felt like it was missing that instant familiarity a lot of comic fans were looking for. 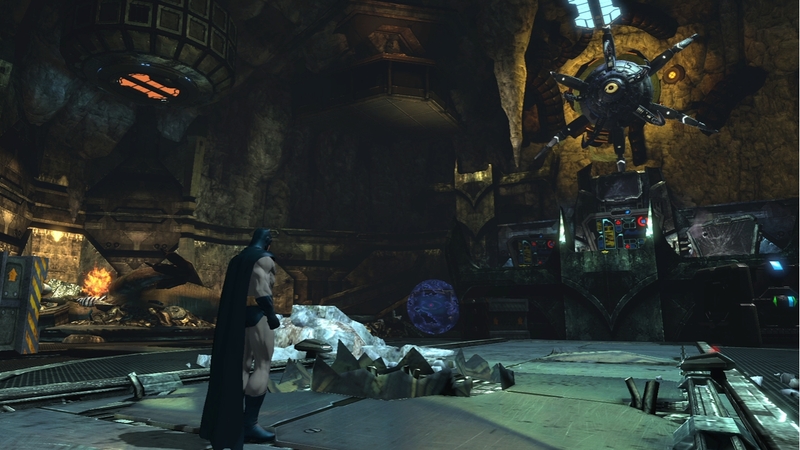 All of which brings us back to DC Universe Online. As a gamer AND a comic fan, I REALLY wanted this game to be good, but to be perfectly honest, I wasn't exactly holding my breath. After all, this game was going to try to do justice to the Justice League for crying out loud. 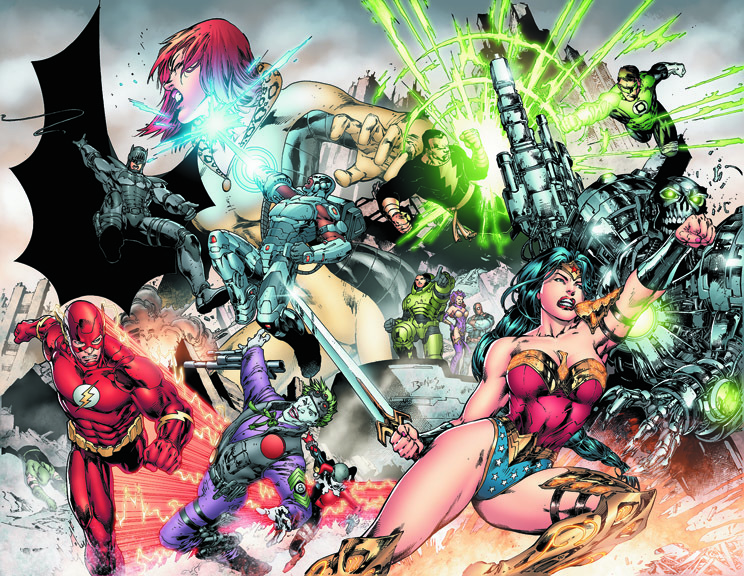 Taking on the DC stable of characters and its rabid fanbase was a daunting task. Still, SOE has done a good job with many of its previous MMO offerings, so I was still holding out hope. Then, when the word came out that DCUO had the creative backing of icons like Jim Lee, Geoff Johns, and Marv Wolfman, my inner geek squealed like a little girl. Now, after a hiccup in development last year forced a delay in the game's final release until just last month, it was time for the game to put up or shut up/ Thankfully for fans like me, it fell squarely into the "Put up" category. Before I completely geek out on what I love about the game, I'll actually start with some of the snags in Superman's cape. For starters, I'm not a fan of the fact that PS3 and PC gamers can't play together. That's right, before you decide which version to get, you're going to want to find out what most of your buddies plan to get it on. And if you think you'll just bite the bullet and pick up both versions (as I have), keep in mind that you'll end up paying for two separate subscriptions ... which is a fair chunk o' change at $14.99/month each. I know that as far as it applies to me, I can SAY I'll probably end up swapping around which account is active, but since I have plenty of friends playing on both systems, odds are greater that SOE is going to manage to hook me for both accounts on a regular basis. Another thing to keep in mind if you pick up the game is that you'll need to have at least a little patience. Whether it's waiting 2 1/2 hours for the PS3 version to fully install the nearly 16GB of data required onto your hard drive, or roaming the streets of Gotham for 30 minutes to an hour (at least) while waiting in virtual line for a Legends PVP or Alert mission to queue up. And of course, there are the occasional disconnects, lags, and other minor glitches that every MMO goes through immediately after launch. To its credit, SOE has been regularly updating the client as fast as possible to iron out those unexpected wrinkles, plus support has been extremely helpful anytime a particularly nasty bug might have popped up for players. That still does nothing for the massive install size on the PS3, but oh well ... nothing's perfect. Now that we've got that out of the way, let's get to the good stuff. DCUO is a fast paced, action packed, full blown comic book experience. In short, it's frikkin' awesome. Initially designed from the ground up as a console experience, the game forgoes a lot of the slow and methodical pacing of most MMO games. Right from the get go, you FEEL like you're a superhero (or supervillain, depending on which way your moral compass points). From the beginning, the mission seem epic in scope. And by having the player take on the role of a new hero instead of one of the mainstays of the DCU, you feel like you're a real part of the bigger world. For me, it's a lot more fun to fight with Zatanna or the Teen Titans by my side than it would ever be trying live up to wearing Batman's utility belt. Let yourself get into the experience, and you can almost imagine your character popping up in the pages of Action Comics next week. Of course, for those of you that DO want to fulfill your dream of being Batman, Robin, the Joker, or any of the other DCU stable, there are 2v2 and 4v4 Legends PvP arena missions, where players jump into the shoes of their favorites and battle in all their comic book glory. While it might seem like the game is short on content (player characters max out at level 30), that couldn't be further from the truth. Besides going back and creating new characters with new mentors, you can always take your capped hero/villain into any of DCUO's huge host of high end content. See, most MMOs I've played, once you cap, there's not a lot to do. With DCUO, though, getting to level 30 is just the beginning. Plus, there's a commitment from SOE and DC to add fresh new content every month, beginning with new Catwoman themed level 30 missions due out this month. And don't worry, rookies. SOE and DC are tossing new content in for you as well. right away that the game was designed with a controller in mind. I could go on and on and on about what I love in DC Universe Online and I probably will in the coming weeks. Right now, though, the best I can tell you is that if you're a comic book fan, you owe it to yourself to check out this game. And even if you don't know your green kryptonite from your red kryptonite, you'll still have a blast jumping into the DC Universe. Now, if you guys don't mind, I'm off to Gotham ... the Batsignal is shining and the Dark Knight could use my help.